Kossan, a traveling Zen monk and sanshin player, has performed in the NYC subway system, Japanese bars and restaurants, and was recently featured on the New York Times blog. His ensemble, Kossan Matsuri, performs Okinawan folk songs and includes male and female vocals, sanshin, and chindon (Brian, Kaori, and Wynn). We’ll be performing at 7pm on Saturday 6/28 in Chinatown, Columbus Park Pavilion. Kossan, Kaori and I will be performing Okinawan folk songs at Suibi, a remarkable Okinawan restaurant in the East 50s. Two sets starting at 7:30pm and 9pm Saturday. Come join the fun! Take the E, V, or 4, 6 to 53rd and Lex. 2:00pm Jeff Arnal Trio with Gordon Beeferman (p), John Dierker (ts, bcl). 3:00pm Nabaté Isles’ Imagination with David Gilmore (g), Sam Barsh (keys), Jaimeo Brown (dr). 4:00pm Kioku. Wynn Yamami (taiko, perc), Ali Sakkal (saxes), Christopher Ariza (el). Review from www.allaboutjazz.com: An unorthodox ensemble under the name Kioku proved the stand-out of the afternoon with an intriguing blend of oriental sonorities, free jazz and ambient noise. 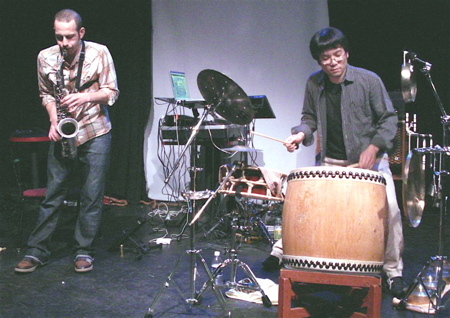 Comprising Wynn Yamami (percussion), Ali Sakkal (alto, percussion) and Christopher Ariza (live electronics), they attracted attention from the off when rattling electronics and percussion gave way to noise reminiscent of a railway station concourse, before Sakkal debuted his passionate raw-toned alto. Yamami’s measured taiko drumming was goosed by funkily rhythmic belches from laptop, before Sakkal erupted with another spirited outing of hoarse cries. A change of pace ensued with the slow-burning atmospherics derived from Sakkal’s sustained long tones against a backdrop of trickling water and gongs in an excellent set. Kossan, Bill, and I will be performing Okinawan folk songs at Suibi, a remarkable Okinawan restaurant in the East 50s. Two sets starting at 7:30pm and 9pm Saturday. Come join the fun! The weather cleared up on Sunday and Japan Day was a blast. There’s a very short clip of us in this segment from Fuji TV and a slightly jittery fan clip here. We’ll be heralding the first movie in the Chinatown Sunset Cinema Series, with free films scheduled throughout the summer. We start playing at 7pm, and as the sun sets, they’ll start the movie Nana. sponsored by AAARI and Chinatown Partnership LDC, with special thanks to Antony Wong! Update: We had a great time in Chinatown and we managed to make the Sing Tao Daily News. You are currently browsing the wynn yamami blog archives for June, 2008.